The association between kidney stone formation and hypertension is well established, but the molecular mechanism linking the two diseases has been unclear. In this study, the authors describe a metabolic pathway that tightly modulates homeostasis of the metabolite succinate. In this pathway, succinate uptake regulates BP, possibly through regulation of the renin-angiotensin system. The same pathway also regulates urinary citrate and oxalate, thus protecting against calcium oxalate stone formation. Mice lacking the slc26a6 transporter, a major succinate transport inhibitor, exhibit reduced urinary levels of succinate and citrate, increased concentration of serum succinate, increased renin secretion, and hypertension. These findings provide a link between kidney stone formation and hypertension through impaired transport of metabolites, and suggest that succinate and citrate signaling and transport are potential therapeutic targets. Background In the kidney, low urinary citrate increases the risk for developing kidney stones, and elevation of luminal succinate in the juxtaglomerular apparatus increases renin secretion, causing hypertension. Although the association between stone formation and hypertension is well established, the molecular mechanism linking these pathophysiologies has been elusive. Methods To investigate the relationship between succinate and citrate/oxalate levels, we assessed blood and urine levels of metabolites, renal protein expression, and BP (using 24-hour telemetric monitoring) in male mice lacking slc26a6 (a transporter that inhibits the succinate transporter NaDC-1 to control citrate absorption from the urinary lumen). We also explored the mechanism underlying this metabolic association, using coimmunoprecipitation, electrophysiologic measurements, and flux assays to study protein interaction and transport activity. Results Compared with control mice, slc26a6−/− mice (previously shown to have low urinary citrate and to develop calcium oxalate stones) had a 40% decrease in urinary excretion of succinate, a 35% increase in serum succinate, and elevated plasma renin. Slc26a6−/− mice also showed activity-dependent hypertension that was unaffected by dietary salt intake. Structural modeling, confirmed by mutational analysis, identified slc26a6 and NaDC-1 residues that interact and mediate slc26a6’s inhibition of NaDC-1. 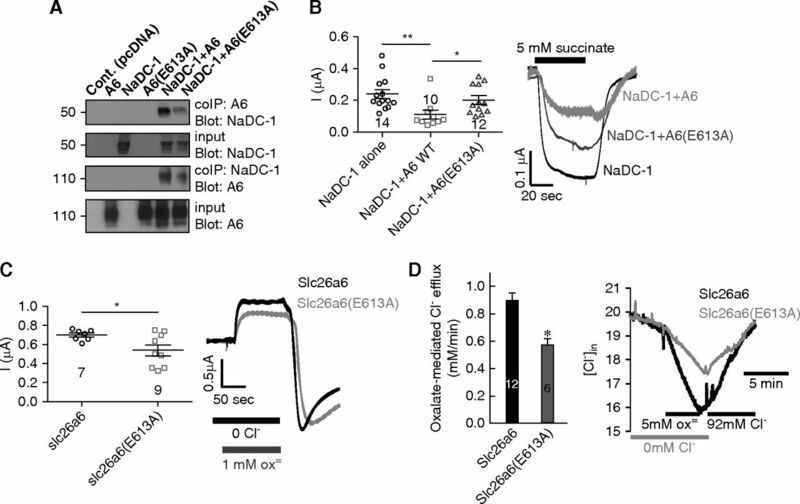 This interaction is regulated by the scaffolding protein IRBIT, which is released by stimulation of the succinate receptor SUCNR1 and interacts with the NaDC-1/slc26a6 complex to inhibit succinate transport by NaDC-1. Conclusions These findings reveal a succinate/citrate homeostatic pathway regulated by IRBIT that affects BP and biochemical risk of calcium oxalate stone formation, thus providing a potential molecular link between hypertension and lithogenesis. As demonstrated in seminal metabolism studies during the 1960s and 1970s, succinate, an intermediate of the tricarboxylic acid cycle, rises during hypoxia, whereas the concentrations of other tricarboxylic acid cycle intermediates drop.1,2 Succinate is present in human circulation and urine, with mean plasma succinate concentrations of 1–20 µM.3−5 Intriguingly, a succinate-specific G protein–coupled receptor, designated SUCNR1 or GPR91, was identified in blood vessels, cardiomyocytes, and kidney epithelia,6,7 suggesting that succinate may function as an essential extracellular signaling molecule. More recently, succinate was shown to serve as a universal metabolic marker of ischemia8 and as a metabolic signaling molecule.6,9 Also, superperfusion of succinate induces renin secretion from isolated glomeruli10 and intravenous injection of succinate increases plasma renin and induces elevation of BP via a SUCNR1-dependent mechanism.6 Moreover, several studies linked succinate elevation to increased SUCNR1 stimulation, which causes renin release and hypertension.9,11 Therefore, elevated succinate absorption to the circulation is expected to cause hypertension. In humans, the major proximal tubule apical succinate transporters are members of the SLC13 family,24,25 which is part of the divalent organic anion:sodium symporter superfamily.26 The physiologic importance of slc13 member 2, NaDC-1, is underscored by the observation that NaDC-1 deletion in mice leads to increased urinary concentrations of carboxylic acids, including succinate, because of failure of reabsorption by the proximal tubules.27 NaDC-1 functions as an electrogenic Na+-dependent citrate/succinate transporter. In the basolateral membrane of the proximal tubule, the slc13 member 3, NaDC-3, mediates Na+-dependent citrate/succinate influx from the interstitium into the epithelial cells.28 The proximal tubule basolateral transporters that mediate succinate extrusion are the organic anion transporters (OATs) 1, 2, and 3.29,30 The OATs function as exchangers that mediate the inward transport of organic anions in exchange for the extrusion of succinate and other metabolic products into the blood.31 Another question we asked is what regulates and orchestrates succinate transport via NaDC-1, NaDC-3, and OAT transporters? Here, we identified the residues in slc26a6 and the succinate transporter, NaDC-1, that affect the formation of the slc26a6/NaDC-1 complex, which is mediated by the vcINDY H4c-like region of NaDC-132 and the intracellular C terminus STAS domain of slc26a6 (slc26a6-STAS). The Gq-coupled succinate receptor, SUCNR1, regulates succinate influx by modulating the NaDC-1/slc26a6 complex and NaDC-3 by the multifunctional scaffolding protein IRBIT, whereas the OAT-mediated succinate transport appears to be IRBIT-independent. Accordingly, deletion of the slc26a6 transporter, which functions as a major succinate transport inhibitor, resulted in reduced urinary and elevated serum succinate (indicating elevated transepithelial succinate uptake), increased renin secretion, and caused activity-dependent salt-independent hypertension. These findings may have significant clinical implications. All of the work on mice and Xenopus laevis were approved by the Institutional Animal Care and Use Committee of the Ben Gurion University of the Negev and of the National Institute of Craniofacial and Dental Research, National Institutes of Health (NIH). Wild-type (WT) and slc26a6−/− mice33 were individually housed in Tecniplast metabolic cages (Tecniplast, Varese, Italy). All mice were on rodent diet and tap water ad libitum during the experiments. After acclimatization to metabolic cages, 24-hour urine samples were collected over the course of three consecutive days. The collected samples were analyzed for urine succinate by an enzymatic succinate test kit (Sigma-Aldrich, St. Louis, MO) and creatinine. HEK293T cells were transfected with the relevant plasmids using the calcium phosphate method. On the day of the experiment, the cells were washed with an incubation solution containing 5 mM KCl, 10 mM HEPES, 10 mM glucose, 140 mM NaCl, pH 7.4. Subsequently, incubation solution supplemented with 3 mM Na+ succinate and 1 µCi 14C succinic acid (ViTrax, Inc., Fullerton, CA) per 1.6 µM cold succinate was added to the cells. The cells were then washed twice in incubation solution and 0.3 ml NaOH (1M) was immediately added to lyse the cells. The lysates were then transferred to scintillation vials containing 0.3 ml of HCl (1M). Alternatively, Xenopus oocytes were incubated with 3 mM Na+ succinate and 1 µCi 14C succinic acid per 1.2 µM cold succinate (to monitor OAT-mediated uptake) or with 1mM Na+ succinate and 1 µCi 14C succinic acid per 0.4 µM cold succinate (to monitor NaDC-1-mediated uptake). Oocytes were then lysed using 200 µl of 2% SDS. Finally, radioactivity was determined by liquid scintillation counting using a Packard 1900CA TRI-CARB analyzer. The osmolarity of all solutions was adjusted to 300 mOsm with the major salt. We used the human NaDC-1 clone (National Center for Biotechnology Information [NCBI] access number BC096277) in the pCMV6-AC-Myc-His vector; the human SLC26A6 clone (NCBI access number NM_022911) in the pCMV6-AC vector; the mouse slc26a6 (NCBI access number NM_134420) in the pCMV6-AC-mKate vector; IRBIT in pcDNA3.1(+); the mouse oat1 (slc22a6 NCBI access number NM_008766) and mouse oat3 (slc22a8 NCBI access number NM_001164635) clones in the pCMV6-Entry myc-DDK vector; mouse NaDC-3 (slc13a3 NCBI access number BC026803) clone in pCMV-SPORT6; and human SUCNR1 (NCBI access number NM_033050) in pCMV6-XL5. All site-directed mutants were generated with QuikChange Lightning Site-Directed Mutagenesis Kit (Agilent, Santa Clara, CA). All constructs were verified by sequencing and immunoblot of the protein products. The genes cloned into vectors pCMV6-AC-mKate and pCMV-AC-myc-His were linearized using relevant restriction enzymes and transcribed in vitro with T7 mMessage mMachine ultra (Thermo-Fisher Scientific, Waltham, MA) or SP6/T7 AmpliCap (CELLSCRIPT, Madison, WI). Oocytes were obtained by a partial ovariectomy of female X. laevis (Xenopus One, Dexter, MI), as previously described.34 Briefly, the frogs were anesthetized and follicle cells were removed in an OR-2 calcium-free medium. The defolliculated oocytes were washed with OR-2 calcium-free medium and healthy oocytes in stages 5–6 were identified, collected under binoculars, and maintained overnight at 18°C in an ND96 solution. Then, 32 nl of the different cRNA were injected into the oocytes using a Nanoliter 2010 injector (World Precision Instruments, Inc., Sarasota, FL). Similar volumes and concentrations (4 µg/µl) of cRNA or water were mixed to achieve similar amounts of injected cRNA per oocyte. The oocytes were incubated at 18°C in an ND96 solution with pyruvate and antibiotics and were studied 48–96 hours after cRNA injection. Voltage and current recordings were performed with a two-electrode voltage clamp as described.18 The current was recorded with a Warner Instrument Corporation amplifier model OC-725C (Hamden, CT) and digitized via an A/D converter (Digidata 1550A; Axon Instruments, Inc., Union City, CA). The electrode tips were filled with 0.5 µl of Cl−-sensitive liquid ion exchanger 477913 (Corning, Corning, NY) and then backfilled with a 3M KCl solution. During measurements, two channels were used for ion-sensitive measurement and another was used to record or control the membrane potential. The Cl− signals were extracted by subtracting the membrane potential signal from the ion-selective electrodes signal. Data were analyzed using the Clampex 10 system. The following solutions were used as indicated in the figures: standard HEPES-buffered ND96 oocyte regular medium containing 96 mM NaCl, 2 mM KCl, 1.8 mM CaCl2, 1 mM MgCl2, and 5 mM HEPES, pH 7.5. Cl−-free solutions for oocytes were prepared by replacing Cl− with gluconate and MgCl2 with MgSO4. Na+ oxalate (in Ca2+-free solution) and Na+ succinate were added to the solutions as indicated in the figures. Cell lysates were prepared by incubating the cells in an ice-cold lysis buffer containing PBS, 10 mM Na+ pyrophosphate, 50 mM NaF, 1 mM Na+-orthovanadate, 1% Triton X-100, and a cocktail of protease inhibitors (Roche, Basel, Switzerland). Extracts were incubated overnight with the indicated antibodies and the complexes were collected with either protein A or G Sepharose beads by incubation for 4 hours at 4°C. Beads were collected by centrifugation, washed three times with a lysis buffer, and the proteins were recovered by heating (37°C for 30 minutes) in the SDS sample buffer. The samples were subjected to SDS-PAGE and subsequently transferred to nitrocellulose membranes (GE Whatman, Pittsburgh, PA). Kidney lysates were prepared after excision of the two kidneys from each mouse. The capsules were removed by pinching and the corticomedullary region was cut out, washed in PBS (pH 7.4), and transferred into an ice-cold lysis buffer described above. The tissue was homogenized and centrifuged at 4°C, the supernatant was collected and sonicated. Total protein concentration was determined by the Lowry method and 60 µg of total protein were loaded from each sample, separated by SDS-PAGE and Western blot analysis was performed. The nitrocellulose membranes were incubated overnight with either anti-SUCNR1 (Novusbio, Littleton, CO), anti-pNCC (Thr53) (PhosphoSolutions, Aurora, CO), anti-IRBIT (Santa Cruz Biotechnology, Dallas, TX), or anti–β-actin antibodies. The putative structure of NaDC-1 was predicted using HHPred software35 with high homology to the crystal structure of a bacterial dicarboxylate/sodium symporter (Protein Data Bank no. 4F35). Prediction parameters were as follows: E-value=7.7e-42, score=374.69, identities=31%, and similarity=0.510. The slc26a6 STAS domain structure was predicted on the basis of the crystal structure of slc26a5-STAS (Protein Data Bank no. 3LLO). The interaction between NaDC-1 and STAS-slc26a6 domain was predicted with HADDOCK software.36 The results of NaDC-1 and the slc26a6 STAS interaction were provided by the software, as follows: score −106.3±5.4, cluster size 5, RMSD from overall low-energy structure 3.5±0, van der Waals energy −43.6±4, and electrostatic energy −271.4±22.5. All final models were generated with PyMol software (Schrödinger, Inc., New York, NY). Blood samples were obtained from the tail vein of slc26a6−/− male mice and their WT littermate controls at 3–4 months of age. Total renin was measured in duplicate using Mouse Renin ELISA test kit according to the manufacturer’s protocol. The mice were prepared for surgery by general anesthesia using isoflurane 1%–3%. While under general anesthesia, the carotid artery was exposed, and two silk suture ties were placed, 6–7 mm apart, under a nonbranching segment of the carotid. The proximal tie was used to secure a catheter in the vessel, and the distal tie, near the bifurcation of the internal and external carotid arteries, was used to ligate the artery. The vessel was then punctured between the two ties to create an arteriotomy for catheter placement. The DSI PA-C10 transmitter catheter (DSI, St. Paul, MN) was introduced and advanced until the catheter tip was in the aortic arch. The catheter was then secured in the vessel using silk ties. Next, the transmitter was placed subcutaneously along the animal’s flank between the forelimb and the hind limb. Using blunt dissection, the skin was separated from the underlying muscle to create a subcutaneous pouch and a tunnel, which began at the cervical incision and extended to the lateral chest. The transmitter was placed through the incision and moved through the tunnel to the subcutaneous pouch. Finally, buprenorphine hydrochloride (0.05–0.1 mg/kg) was administered for pain relief and the mice remained in an oxygenated cage overnight. After 14 days of recovery, the mice were fed NIH 31 chow and housed in cages that were placed on top of the receivers to monitor 24-hour systolic BP and heart rate (measurements were taken at 5-minute intervals). To test the effects of NaCl on systolic BP and heart rate, the mice were fed with high salt (4% NaCl) diet for 2 weeks, followed by a week of regular NIH 31 chow and another 2 weeks of a low-salt (0.49% NaCl) diet. For physical stress tests, the mice were trained to run on a treadmill (Model Eco-6M; Columbus Instruments, Columbus, OH) and then exposed once a day to moderate-intensity exercise (treadmill speed of 10 m/min) for 15 minutes, and their BP and heart rate were simultaneously recorded with the DSI telemetry system. The imaging system consisted of an Eclipse Ti inverted microscope (Nikon, Tokyo, Japan), a PE-4000 LED monochromator (CoolLEd, Andover, UK), and Hamamatsu flash 4.0LT camera (Hamamatsu Photonics, Hamamatsu City, Japan). Fluorescence images were acquired and analyzed with NIS-Elements software. Ca2+ imaging was performed in HEK293T cells attached to coverslips and perfused with a regular solution containing 140 mM NaCl, 5 mM KCl, 1 mM MgCl2, 10 mM HEPES, 1 mM CaCl2, and 10 mM glucose, pH adjusted to 7.4. A Ca2+-free solution was prepared without CaCl2, and Na+ succinate was added to the solutions as indicated. [Ca2+]i was monitored by transiently expressing the Ca2+ sensor protein GCaMP in HEK cells in the presence or absence of SUCNR1. Significance was analyzed by t test and was set as follows: *P<0.05; **P<0.005; and ***P<0.001. All results are presented as mean±SEM. N is indicated in the figures. To understand the molecular mechanism by which slc26a6 inhibits NaDC-1 to control succinate and citrate homeostasis, we used in silico analysis to predict the NaDC-1 and slc26a6-STAS structures on the basis of the crystal structures of the bacterial succinate transporter vcINDY32 and the STAS domain of slc26a5.38 In addition, we searched for their potential interacting sites using the HADDOCK software.36 The results are shown in Supplemental Figure 1. We identified a negatively charged surface on slc26a6-STAS that includes E613 and is spatially oriented to potentially interact with a positively charged surface of NaDC-1 that includes K107 and R108 (Supplemental Figure 1, A and B). The positively charged residues K107 and R108 on H4c are conserved among the SLC13 family members (Supplemental Figure 1C). On the basis of these findings, we hypothesized that the interaction between slc26a6-STAS and NaDC-1 is electrostatic and is mediated by NaDC-1(K107 and R108) and slc26a6(E613). To test the model and study the role of distinct residues in the NaDC-1–slc26a6 interaction, we tested the effects of slc26a6(E613A) and the NaDC-1 mutation on NaDC-1–slc26a6 interaction by coimmunoprecipitation (CoIP). The slc26a6(E613A) mutant showed reduced interaction with NaDC-1 (Figure 1A) and reduced inhibition of NaDC-1 activity, assayed as Na+-dependent succinate currents (Figure 1B). Although expression of slc26a6 was not affected by the (E613A) mutation, slc26a6(E613A) had approximately 30% lower Cl−/oxalate exchange activity (Figure 1, C and D). These findings suggest that a reduced oxalate transport by slc26a6(E613A) in the intestine together with an attenuated inhibition of NaDC-1 in the renal proximal tubule may cause hyperoxaluria and hypocitraturia,18 as observed in the slc26a6−/− mice. The role of NaDC-1(K107) in the NaDC-1–slc26a6 interaction is shown in Figure 2. Although NaDC-1(R108A) was inactive (not shown), NaDC-1(K107A) retained transport activity. However, the interaction between NaDC-1(K107A) and slc26a6 was reduced (Figure 2A) and NaDC-1(K107A) was not inhibited by slc26a6, which strongly inhibits WT NaDC-1 (Figure 2B). These results suggest that NaDC-1–mediated succinate transport is controlled by the interaction between the two transporters, and that E613 at the slc26a6-STAS domain and K107 at the NaDC-1 H4c region are required for their interaction. Differences between human and mouse slc26a6 have been previously reported.39 Monitoring interaction (Supplemental Figure 2A), and inhibition of human NaDC-1–mediated succinate transport by human SLC26A6 using both electrophysiologic measurements (Supplemental Figure 2B) and 14C succinate flux assay (Supplemental Figure 2C) in Xenopus oocytes showed that mslc26a6 and hSLC26A6 had similar effects on NaDC-1. Our next question was whether succinate signaling is linked to succinate transport. The succinate receptor, SUCNR1, is a G protein–coupled receptor expressed on the apical membrane of epithelial cells in the kidney, intestine, and other tissues, and acts as either a Gq- or a Gi-coupled receptor.12,13 Accordingly, stimulation of HEK293T cells transfected with the SUCNR1 with 5 mM extracellular succinate leads to Ca2+ release from internal stores (Figure 3A). IRBIT is a scaffolding protein that regulates the activity of several transporters40 and is released from IP3R upon binding of IP3 to the receptors.14 We therefore asked whether IRBIT interacts with NaDC-1 to regulate its activity and whether SUCNR1-stimulated IRBIT release from the IP3Rs controls the interaction between IRBIT and NaDC-1. 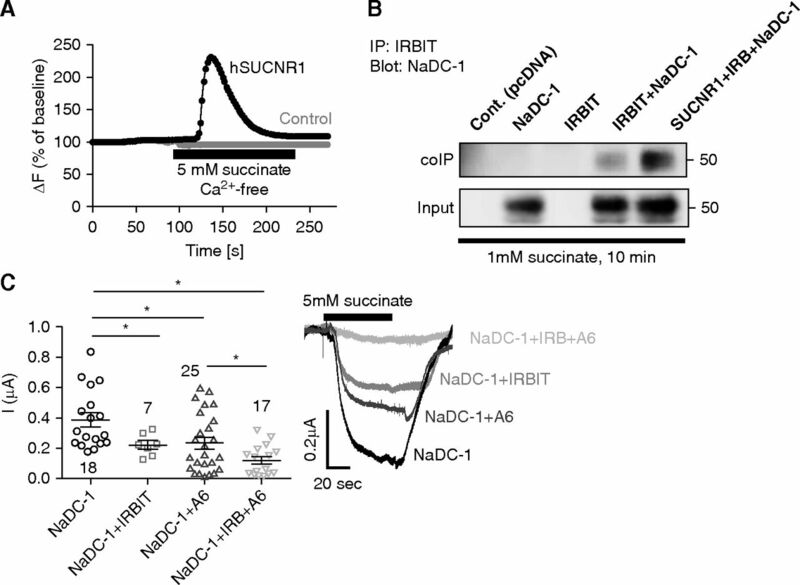 Assay by CoIP showed that IRBIT interacts with NaDC-1 and the interaction is markedly enhanced by stimulation of the SUCNR1 receptor with 1 mM succinate (Figure 3B). The functional consequences of the interaction of IRBIT with NaDC-1 is shown in Figure 3C. Both slc26a6 and IRBIT inhibited NaDC-1–mediated succinate transport by approximately 50%. Significantly, the inhibition was more pronounced when both IRBIT and slc26a6 were coexpressed with NaDC-1, reaching approximately 70% (Figure 3C). Together, these findings indicate that a functional crosstalk occurs between the IRBIT signaling pathway and the succinate transport complex, NaDC-1–slc26a6, and that this crosstalk leads to a further inhibition of succinate transport. We propose that this mechanism may act as a metabolic senso-regulatory mechanism that fine-tunes transepithelial succinate absorption via succinate signaling. The major basolateral succinate extruders are members of the OAT family and include OAT-1, OAT-2, and OAT-3. To determine whether IRBIT regulates succinate efflux via interaction with OATs, we monitored the interaction of OAT-1 and/or OAT-3 with IRBIT by CoIP. Figure 4A shows that the binding of IRBIT to OAT-1 is very low, whereas the binding to OAT-3 is not detectable. Hence, we tested whether IRBIT regulates the OAT-1 function by monitoring succinate uptake into either Xenopus oocytes (Figure 4B) or HEK293T cells expressing OAT-1, IRBIT, or both (Figure 4C). Succinate uptake was elevated by expression of OAT-1 alone, which was abolished by the OAT inhibitor probenecid (Figure 4, B and C). Neither IRBIT, SUCNR1 stimulation, nor inhibition of PLC by U73122 affected the OAT-mediated succinate uptake. 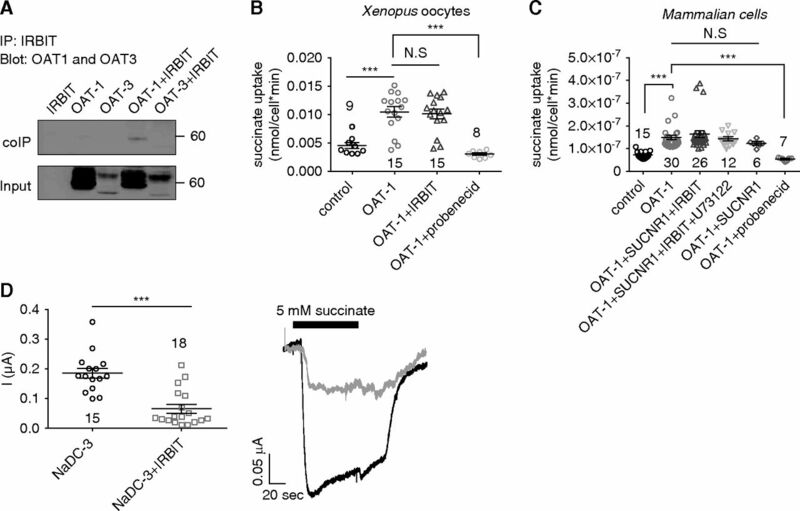 These findings indicate that OAT-1 activity is IRBIT-independent. To further investigate the role of IRBIT in regulating basolateral succinate transport, we monitored the effect of IRBIT on the regulation of the basolateral succinate transporter NaDC-3. Figure 4D shows that IRBIT markedly inhibited succinate transport by NaDC-3. This finding indicates that signaling via the IRBIT pathway orchestrates succinate influx, but not efflux, in both the apical and basolateral membranes to control transepithelial succinate/citrate absorption and metabolism. The physical and functional interaction between NaDC-1 and slc26a6, in which slc26a6 inhibits NaDC-1, raised the possibility that slc26a6 affects not only vectorial citrate, as we previously showed,18 but also vectorial succinate transport in the proximal tubule. This is further suggested by a previous report of a possible lower urine citrate and succinate concentration in slc26a6−/− mice.41 To test this prediction, we collected 24-hour urine samples from WT and slc26a6−/− mice and measured the levels of succinate in the urine. As shown in Figure 5A, urinary succinate concentrations in slc26a6−/− mice was reduced by approximately 40% compared with control mice, whereas urinary creatinine levels were not different between the two groups (Figure 5B). The results presented in Figure 5 indicate that hypocitraturia is accompanied by “hyposuccinaturia.” Notably, as indicated in Figure 5C, serum succinate levels are approximately 35% higher in slc26a6−/− mice, suggesting elevated absorption of succinate from the urine. High succinate absorption to the serum can ultimately increase stimulation of the succinate receptor SUCNR1 in endothelial cells of the afferent arteriole, which, in turn, would lead to elevated renin secretion by granular cells at the juxtaglomerular apparatus.11 To test this scenario, we measured plasma renin concentration, and found approximately 30% increase in plasma renin in slc26a6−/− mice (Figure 5D). To test the effect of high serum succinate on the renal SUCNR1-IRBIT signaling axis, we monitored SUCNR1 and IRBIT expression in kidney lysates, which were obtained from WT, slc26a6−/− mice and WT mice intravenously injected with succinate (10 mg/kg body wt). As shown in Figure 5E, SUCNR1 expression was not significantly different between the groups. As presented in Supplemental Figure 3, A and B, IRBIT expression in renal lysates of slc26a6−/− mice was similar to the expression in lysates of WT mice. Nevertheless, we monitored a small (approximately 10%) but statistically significant decrease in the renal IRBIT expression of WT mice injected with succinate. This may be a result of the acute increase in succinate, which is compensated for during chronic succinate increase, as occurs in slc26a6−/− mice. The increased serum succinate appeared to affect BP. A 24-hour telemetric BP measurement indicated that slc26a6−/− mice are hypertensive, specifically during the nocturnal awake/active phase hours (Figure 6A). Further analysis indicated that the slc26a6−/− mice hypertension is not additive with the effect of dietary salt intake. 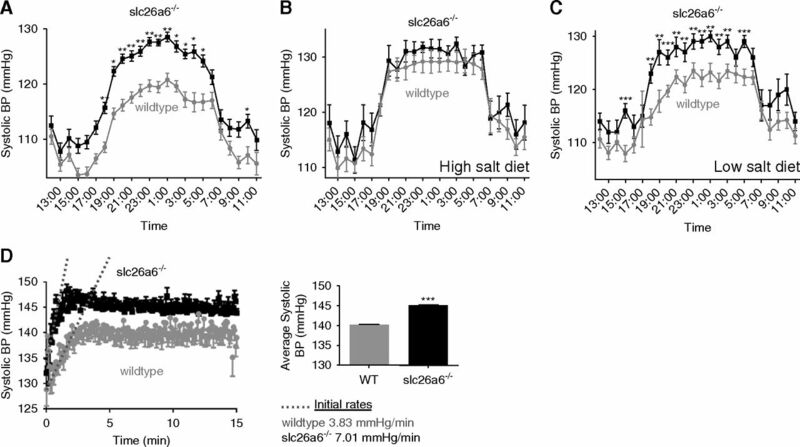 Thus, when mice were acclimated to a high-salt diet, the difference in BP between WT and slc26a6−/− mice disappeared (Figure 6B) and the higher BP in slc26a6−/− mice was maintained when mice were fed a low-salt diet (Figure 6C). Heart rate measurements that were simultaneously acquired with BP measurements are shown in Supplemental Figure 4A. To investigate the role of slc26a6 deletion and physical activity on BP, we assayed the acute increase in BP in response to exercise. Figure 6D shows that systolic BP increased faster and to a higher level in the slc26a6−/− mice. Regulation of salt and water absorption by the renin-angiotensin system is a major mechanism of BP control. Specifically, the expression and function of Na+Cl− cotransporters (NCC) are modulated via phosphorylation. We investigated the effect of hypertension in slc26a6−/− mice (which we show here to be associated with elevated succinate uptake to the serum) on salt retention by monitoring the expression of Thr53 phosphorylated NCC cotransporter (pNCC), reporting the active form of the transporter. Interestingly, lower expression of pNCC is observed in both slc26a6−/− mice and WT mice intravenously injected with succinate 10 mg/kg body wt compared with WT controls (Supplemental Figure 4B). These findings may explain the salt independency of hypertension in the slc26a6−/− mice. In addition to the morbidity caused by kidney stones, numerous studies show that kidney stone formation is associated with elevated risk for developing hypertension.19−23 Our current and previous results reveal a common underlying metabolic mechanism that links calcium oxalate kidney stone formation and hypertension (Figure 7). Here, we show that male slc26a6−/− mice, which develop calcium oxalate stones, are hypertensive and with hyposuccinaturia (low urinary succinate), in addition to the previously observed hypocitraturia (low urinary citrate). For these experiments, we utilized only male mice because approximately 90% of male and only 25% of female slc26a6−/− mice present with bladder stones,42 and the use of male mice also eliminates potential hormonal effects. We found that activity-dependent hypertension in slc26a6−/− mice showed up primarily during the night (activity hours) and not during the day (Figure 6A). This phenomenon may be linked to the tight regulation of metabolism, renal function, and BP by the circadian system.43−45 Rhythmic changes in the concentrations of succinate, citrate, and other metabolites have been demonstrated in human urine samples and saliva.46,47 In addition, renal Na+-dependent transporters are under stringent circadian control.48 Therefore, the effects of impaired metabolism and renal metabolite transport on BP could have been detected only by the 24-hour telemetry BP measurements. Other methods are limited to day measurements, anesthetized animals, or lack of sensitivity. Indeed, previous measurements of BP in anesthetized mice49 or by tail-cuff50 did not observe a significant difference in BP between slc26a6−/− and control mice. Intriguingly, the hypertension in slc26a6−/− mice is not affected by dietary salt intake (Figure 6, B and C). To obtain evidence that succinate in the plasma of slc26a6−/− mice is related to the NaCl-independent BP phenotype, we compared the level of renal Na+Cl− cotransporter phosphorylation in WT mice with increased plasma succinate and in slc26a6−/− mice. We found that phosphorylation of NCC is significantly lower in both slc26a6−/− mice and WT mice intravenously injected with succinate, compared with WT littermates (Supplemental Figure 4B). This work reveals that a common metabolic pathway controls succinate and citrate homeostasis and consists of an apical and basolateral succinate/citrate transporters regulation. The apical uptake of succinate/citrate is inhibited by slc26a6, whereas both apical and basolateral succinate transport are orchestrated by the succinate signaling pathway. 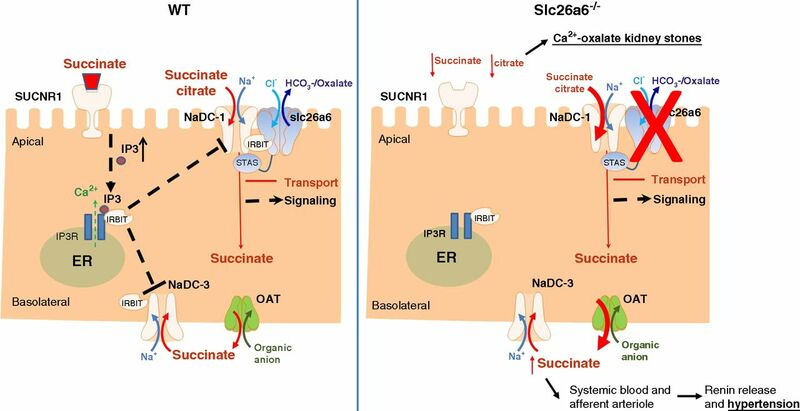 Apical NaDC-1–mediated succinate/citrate uptake is regulated by slc26a6, as revealed by deletion of slc26a6 in mice, which results in reduced urinary concentration of these metabolites and increased concentration of serum succinate (Figure 5). The regulation of NaDC-1 by slc26a6 appears to be mediated by electrostatic interaction between the transporters. This is supported by the findings of reduced interaction with and inhibition of NaDC-1 by slc26a6(E613A) and similar effect by the NaDC-1(K107A) mutant. Indeed, K107A is predicted to be located within the H4c domain of the putative NaDC-1 structure or, alternatively, within the ICL1 region.18 These findings lead to the conclusion that impaired slc26a6 function may result in three independent deleterious physiologic consequences: (1) hyperoxalemia and hyperoxaluria because of impaired slc26a6-mediated oxalate secretion in the intestine; (2) hypocitraturia; and (3) hypersuccinatemia and hyposuccinaturia, caused by elevated NaDC-1–mediated succinate uptake due to relieved inhibition of NaDC-1 by slc26a6 in the kidney. Several mechanisms have been suggested as the underlying etiology for the clinical association between calcium oxalate kidney stones and hypertension, including tubulointerstitial damage, changes in dietary Na+ intake, and altered renal handling of calcium (“calcium leak”).21 Taylor et al.51 tested an association between hypertension and urinary calcium excretion and reported no consistent relationship; rather, a strong association was reported between hypertension and hypocitraturia. Because both citrate and succinate are handled by NaDC-1 and succinate is associated with hypertension, we conclude that although low urinary citrate is the cause of calcium oxalate stone formation, the hypersuccinatemia and the associated high renin are the cause of the hypertension. This article contains the following supplemental material online at http://jasn.asnjournals.org/lookup/suppl/doi:10.1681/ASN.2018030277/-/DCSupplemental. Supplemental Figure 1. Model of NaDC-1 and slc26a6/STAS interaction sites. Supplemental Figure 2. Human SLC26A6 interacts with human NaDC-1 and inhibits NaDC-1–mediated succinate transport. Supplemental Figure 3. Renal IRBIT expression. Supplemental Figure 4. Telemetric heart rate measurements and pNCC expression in slc26a6−/− mice. E.O. designed the study; A.K., S.A.-J., M.F., H.E.-R., L.S., S.A., E.A., T.S., A.N., N.S., and E.O. carried out experiments and analyzed the data; A.K., M.F., H.E.-R., S.A., E.A., T.S., S.M., and E.O. made the figures; O.W.M., S.M., and E.O. drafted and revised the paper; all authors approved the final version of the manuscript. This work was supported by United states-Israel binational science foundation grant 2015003 to E.O. and S.M., and by Israel Science Foundation grants 271/16 and 2164/16 to E.O.